Following our first ever Ealing E-Safety Conference for schools last year, we were approached by several local schools interested in developing their own e-safety programme to equip students and their families with the knowledge and skills to stay safe online. We used the expertise of our current team of student CyberMentors to create and pilot our new School CyberMentor Programme. This was achieved through consultancy and support from the Ealing Health Improvement Team, the local authority and from practitioners across social work, counselling, therapy, mentoring, victim support and youth work. What is the School CyberMentor Programme? The programme is an interactive training package for young people aimed at developing key skills to become e-safety ambassadors and peer-mentors in their own schools. Within this role they are equipped to support peers with issues around bullying, cyberbullying and emotional wellbeing as part of a whole school approach to e-safety. The training programme uses role play and other techniques to introduce the students to typical scenarios they might face and equip them with critical thinking skills for mentoring. During the training key staff identified to lead in e-safety, which is crucial to developing and embedding the programme across school. The programme also includes access to a personalised Toolkit with useful promotion material, presentations and refresher training tips for circle time, parent sessions and assemblies, to be delivered by trained mentors and staff. After completing the training the graduates are awarded certificates and receive CyberMentor badges for their blazers so they can be identified by their peers. Nominating a team of staff (represented by Inclusion, pastoral, child protection, SLT, ICT and learning support) to be part of an E-Safety/Safeguarding Committee. All staff attend a specialist Child Exploitation Online Protection (CEOP) training session. Selecting up to 30 suitable students to be trained as school CyberMentors. Completing a partnership agreement with Greenford High School and a 3 month post professional evaluation outlining developments linked into their action plan. 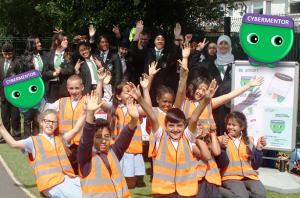 Our School CyberMentor Programme is now at a point where it has been developed, piloted, evaluated and tweaked in Greenford High school and across schools participating in the project. To support our transition partnerships, we also ran a Primary E-Safety Leadership Day in November 2015 for seven partner primary schools, where staff designated to lead in e-safety were invited to attend a CEOP session. It was an opportunity for them to find out more about selecting appropriate pupils, incorporating the School CyberMentor programme into their schools and the impact peer-mentors have made from participating schools. We would like to thank Stanhope Primary for showcasing their successful model of junior CyberMentors! Stay posted for developments in the upcoming months!